Climatic conditions and time available do not always allow us to practice outdoors as often as we wish. During the off-season or whenever we lack time to play a complete round of golf there are some simple indoor golf drills we can easily perform at home or in the office. The idea is to focus on the three areas of the game that will have the greatest impact on your score: putting, pitching and swing. The indoor putting, pitching and swing drills designed by Jack Moorehouse (see article below) do not require any specific equipment or indoor golf gadgets. They can be executed with the help of simple props readily available at home or at your office, such as a phone book, a towel, etc. Of course you’ll need some golf balls and your putter, pitching wedge and an 8 iron (ideally also your 7 and 9 irons). For the pitching drills you may want to use limited flight golf balls or practice golf balls with holes depending on the space available to practice. 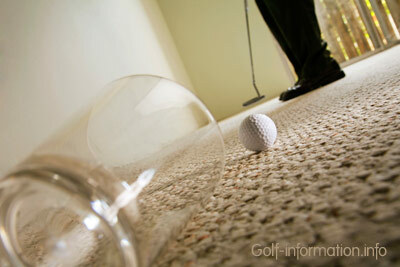 They are designed to simulate the flight of a conventional golf ball, but may be safer to play indoors. Master the three scoring clubs-the driver, the wedge, and the putter-and you’ll improve your game dramatically. With 14 clubs to hit, golfers often have trouble deciding which part of their game to work on. If you’re serious about working on your game, focus on the three scoring clubs. They have the greatest impact on your score. Unfortunately, not all of us live in a climate where we can always practice outdoors. Even if we do, we don’t always have the time to go to a driving range and hit balls. 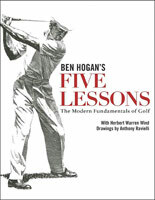 That doesn’t mean we can’t work on the fundamentals needed to master the three clubs. We just need to do it indoors. Below are several indoor drills that will help you master these three clubs. They can are done in almost any location, even your office. There are three “musts” in becoming a good putter: (1) your stroke must follow target line; (2) your putter must remain square to the target line; (3) and your forward stroke must equal (or slightly exceed) your backstroke. The following drill emphasizes these putting musts. The next drill focuses on distance control, also a key aspect of putting. 1. Drop two phone books on the floor. Position them far enough apart so that your putterhead barely squeezes through them. 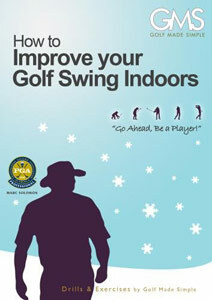 Place a golf ball between the books, assume your putting posture, and make your stroke. Use the books as a visual guide to match the lengths of your backstroke and forwardstroke. Matching the lengths ensures a smooth stroke with perfect tempo. You’ll find it difficult to guide your putter between the phone books unless your stroke follows the intended putting line. If your putter strikes the side of either book, your stroke strayed off-line. Also, mark your ball with a straight line. Set that line parallel to your target line. Marking the ball makes it easier to align the putter perpendicular to the target line at address. See if the line falls to the right or left of center as your ball rolls after impact. If it does, then your stroke may have deviated off-line or made contact with a slightly open or closed putter face. 2. This drill improves distance control. Set or balance a ball (or a tee turned upside down) on a penny and putt a second ball to this ball so that it touches the first, but DOESN’T knock it off the penny! This one is SUPER TOUGH! Try various distances. You should soon forget about the line and “making” the putt-distance control is everything. Rolling the ball to the target with an acceptable “sink” speed becomes second nature as you try to just touch the target ball. These drills can be done just about anywhere. It improves one of the most important parts of your game-wedge play. Find about 10 feet of open floor space. Put a small towel on the floor and stand about 10 feet away. Use a short, smooth stroke, keeping your hands ahead of the clubface. Try chipping 50 balls onto the towel. Practice so the balls land on the towel, not come to rest on the towel. Start with an 8 iron, then move to a 9 iron, and then to a wedge. The more you practice the better control you’ll have over those short chips. Next time you’re on the practice range, try the same drill. Watch how far each club makes the ball roll on the putting surface. Now you’ll have more control over your chips under different conditions. After awhile, you should be able to nestle every shot close to the pin, or sink it! Many golfers turn their hips and shoulders simultaneously when swing a club. Too much lower body rotation eliminates torque between the upper and lower body. Adding more backswing torque to your swing generates distance. 1. Sit down in a chair. Spread your feet out wide and keep them flat on the ground. Hold a 7 or 8 iron out in front of you. Hold the clubhead with one hand and the end of the grip in the other hand. Raise the club over your head and rest the shaft across your neck and shoulders. Turn your shoulders to the right. Hold this position for a few seconds. You should feel a lot of torque along your left side. The turn your shoulders back and face forward. Relax and repeat. Many golfers use their hands and arms only when swinging the driver. They don’t rotate their shoulders, sapping power from their swing. This drill helps keep your hands, arms, and shoulders in sync as you swing back and through. 2. Lower yourself down to the floor onto your knees. Hold a ball between your hands and out in front of your. Start by making some small moves swinging the ball back and forth. The idea is to keep the ball in front of your chest as your arms swing and your shoulders rotate. Increase the length of your swing going back and through. As you reach the end of your backswing and forward swing, allow your arms to fold. Swing back and fold your arms. Swing down and unfold them. Swing through and fold them again. These drills improve control of the three most important clubs in your bag-the driver, the putter, and the wedge. You can do them in your house or your garage. Each focuses on fundamentals you must master to take your game to the next level. Jack Moorehouse is the author of the best-selling book “How To Break 80…And Shoot Like The Pros!” http://www.howtobreak80.com. He is NOT a golf pro, rather a working man that helped thousands of golfers lower their handicaps without quitting their day jobs.